Reported by The Courier, Leamington Spa. The number of homeless people sleeping rough in Warwick district has dropped to a six-year low, the council has claimed. A count undertaken by Warwick District Council in November found that 12 individuals were recorded as sleeping on the streets, compared to 21 at the same time last year. This is the lowest number recorded for six years. The council has said the reduction is largely down to a number of initiatives it has put in place this year to support the homeless. September's opening of William Wallsgrove House in Lillington Road as a direct access hostel now provides round the clock accommodation, on-site support and referrals for around 20 people all year round. And the provision of further accommodation for the Coventry Cyrenians to support people with complex needs has also helped. 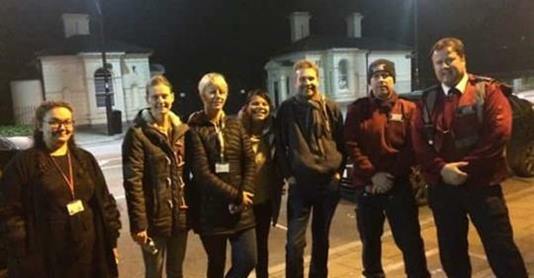 The Rough Sleeping initiative has also included the appointment of specialist council support staff and has allowed homeless charity P3 to bring in additional outreach workers across Warwick and Stratford districts. The council’s portfolio holder for Housing and Property Services, Cllr Peter Phillips said: “This is an encouraging start and testament to the hard work of the rough sleeping team. "However, the work of our rough sleeping team continues with more people still to help, in not just providing a temporary fix for those sleeping on the streets, but in providing these vulnerable people with the specialist support and care they need to help them turn their lives around." Residents will be able to find out more about the work the council and other organisations are doing to help rough sleepers on Wednesday December 12 outside Leamington Town Hall from noon to 3pm . Warwick District Council’s rough sleeping team and Rangers will be joined by representatives from P3, Police, Tesco, Salvation Army, The Cyrenians and Helping Hands to share information about rough sleeping and the local services that are available. They are also aiming to encourage people to donate to homeless organisations rather than giving homeless people money directly.